“S.A.F.E. Project is honored that Schmidt Peterson Motorsports would allocate valuable visibility on board two of its IndyCar entries for this year’s Indianapolis 500 to highlight the importance of reversing the opioid epidemic that is devastating our country, and particularly this region of the United States. We are proud to be part of this team.” – Admiral Sandy Winnefeld. Watch Indy Car driver #6, Robert Wickens, talk about the dangers of opioids here. 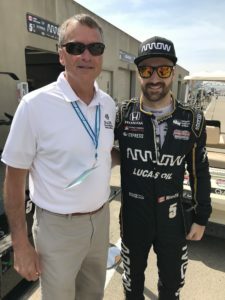 James Hinchcliffe talks about staying “safe” with opioids here. To read the transcript of the May 17 press conference click here. To view the photos from the event, click here. An NIH study showed that nearly 10 percent of adults have suffered from an addiction disorder, and that 75 percent never seek treatment. The cost of treating a patient diagnosed with addiction is more than 550 percent higher than treating non-addicts. Professional charges for opioid abuse and dependence rose by more than 1000 percent from 2011 to 2015. This is an increase of $650 million in four years. 15 billion opioid tablets were dispensed per year in retail pharmacies in the US in 2013 and 2014, far more per capita than any other nation. 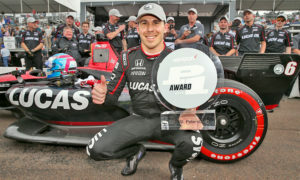 IndyCar Driver Robert Wickens warns “Don’t let opioids take control of your life” in this public awareness announcement. Schmidt Peterson Motorsports partnered up with S.A.F.E. Project US during the 102nd Indy500 to raise awareness about the opioid epidemic. James Hinchcliffe advises everyone to “be smart patients” when talking to your doctors or dentists about prescription opioids. Schmidt Peterson Motorsports partnered up with S.A.F.E. Project US during the 102nd Indy500 to raise awareness about the opioid epidemic. Schmidt Peterson Motorsports and S.A.F.E. Project US today announced their partnership.